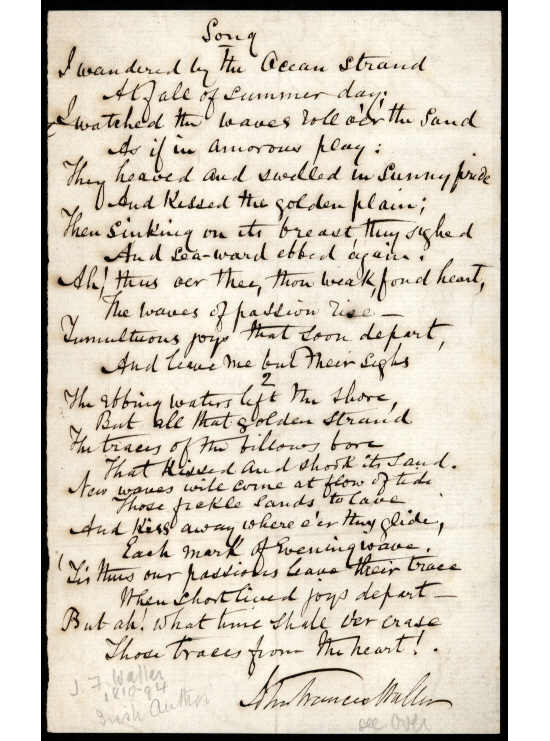 Autograph Verses Signed ‘John Francis Waller’, entitled ‘Song’, beginning: I wandered by the Ocean Strand/ At fall of summer day…” 24 lines on 1 page 7 x 4½ inches, in good condition. Undated. John Francis Waller (1810 – 1894), Irish poet and editor. He became a contributor to and ultimately editor of the Dublin University Magazine, usually writing under the pseudonym of “Jonathan Freke Slingsby”. He published several volumes of poems and also wrote popular songs, including Cushla Ma Chree, The Spinning Wheel and Song of the Glass. He was responsible for the explanatory notes and a life of the author in a new edition of Gulliver’s Travels.